Fellow 86ers is selling his two condos. Good location. One is just next to PWTC. Sudah mempunyai tanah dan ingin membina sebuah banglo atau rumah di atasnya? Perlukan kontraktor untuk pengurusan kertas-kerja kelulusan dan membina bangunan tersebut? Emel saya untuk maklumat lanjut. Want to increase your mojo to the max plus maintaning your reproductive system is in good condition. On August 25th, 2002, some of the 86ers had suddenly felt that after many years going on with our life, there was the need to get together the VI86ers as a team. The idea was toyed and played around until out of a sudden a meeting was called to discuss on the formation of a club. The first meeting brought us a group of VI86ers to VIOBA for the first MEETING. Most have noble cause and a few have intentions. The main idea was to link back among us in business and personal issues. And also to get VI86ers to join VIOBA as members. Whatever in the minds of these VI86ers, a protem committee was formed and we were about to have fun. I volunteered on preparing the website and a forum site. While the rest figures on activities for the club. The first agenda was to do a gathering and to annouce the existence of the club. A membership card was thought to be the best to provide identity to the members. The club was also the get VI86ers to register as VIOBA members. And it was to be included in the membership fee. 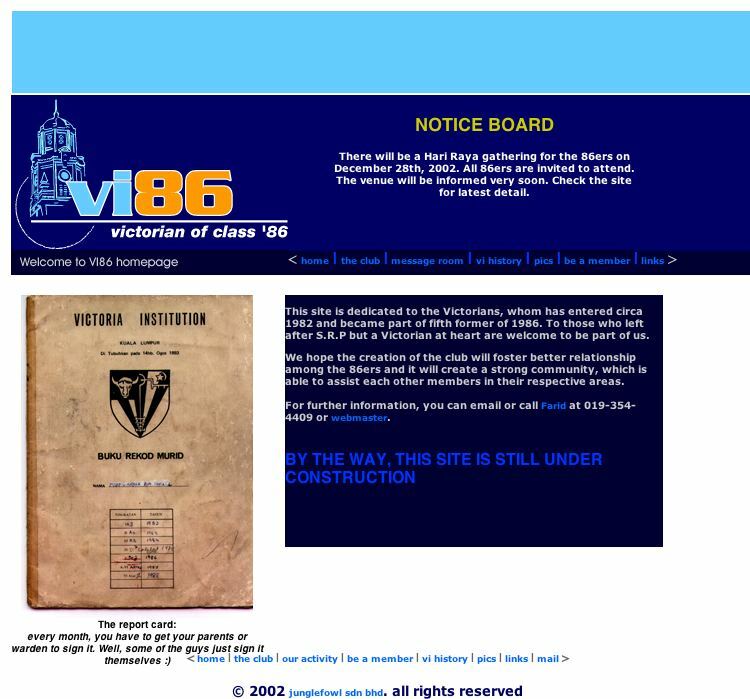 The website was a simple work and it works as the communication tool to all VI86ers. It created an identity for the VI86ers regardless who they are. To create an identity of the club, I've created the logo design comprising of a hand sketch drawing of the VI Tower and the word VI is in light blue and 86 in orange. The logo created was later use on our membership card. Less than 50 were created. Tee shirts was also created and uses the same logo design. Corona Hotel was selected as it is located quiet near to the school. So, the first content focuses on the event. As for the gathering, the event was a success and around 50 VI86ers came. Business cards and mobile numbers were exchanged. All had a superb time and we were happy. So the next agenda was to organise more events. Since I got time, I started to toy with the web header design. I started to scan my photo collection and it was embedded to the header design. These pics can be seen in the GALLERY section. As the days progressed, I made further changes on the header design. Earlier on, a crest was designed based on the school badge. It was the brain idea of Ilham Akbar aka Rocky who was doing research on family crest. 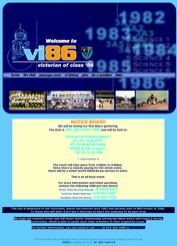 The VI86 crest emblazoned the numerical number of "86" while the colours remain as VI colours. Some of the VI badge elements was included. It was just for fun. The design was embedded as the background to the web header and was also the background design on the VI86 membership card. I've added the NEWS BULLETIN section, so news can be related to all VI86ers or those who are interested in us. The news was more focus on events and news that should be interesting to the VI86ers. A forum site was created using Yahoo.group and existed to as of today. Click here to go to the forum site. As the month progressed, the news section gets longer. But the content remain the same. There was no photos to add except from the event we had. It seems that everyone is busy and it was up to a few of us to organize while others will just be spectators. The VI86ers were given the priviledge to handle 7-side Soccer Tournament. The event was to be the last official VI86 Club event as there were committee members whom actually are IN for their glory and money. Actually, the event had highlighted the true self of certain Victorian of their true self. However, for the rest of VI86ers, life goes on. We had numerous impromptu gathering at Seri Hartamas. Andrew Tan and Dr. Ali even had organized golf sessions at Bukit Kiara. Andy Ho, Roy and me organized a family getaway at Sungai Congkak, Recreation Park and later to Port Dickson. The bonding between VI86ers that look forward to meet familiar faces after all these years were clearly shown regardless of race, who and what you are. The 7-A-Side Tournament was a success and till today have been the starting point of an annual event. It later renamed Mokhtar Dahari Soccer Tournament in the honour of the late Mokhtar Dahari, a Victorian. We enjoyed the tournament not in watching it but on the picnic we had at the field. One of our teacher came to join the fray. In later months, we kept on having sessions like karaoke, dinner and a lot of other things. However, actions by those in the dark side was too much and the situation was placed on the website but was later removed by me. But their actions were already acknowledged by all. A meeting was held to clear things with Dr. Ali as the mediator ('82-'86)) and I had placed a condition that required transparency. Till today, that condition was never met. It really shows that those who became fifth former in VI are those that should be in the committee of VI86. The damage was done and to remedy it was difficult. To make things worst, they announced that the club is now defunct. In one year, the club committee is no more. It remains a PROTEM till the end. I did the last redesigning and in the website I aired my feelings. Some want to revive back with new faces but there were no takers. The website was a major revamp but time and money was not on my side. New headers with the inclusion of 3D texts were added. It was never completed. . By then I was busy in business projects and using a dial-up to update the website was getting expensive. Bear in mind, I was never paid a single cent to maintain the website. So the website was left idle till end 2005. So is it the end? To me it was not. With broadband available now, I decided to create the new look and hopefully it will revive the camaradie among us and we can get together and have fun, Still got to figure out how to pay the monthly access. And there you have it. 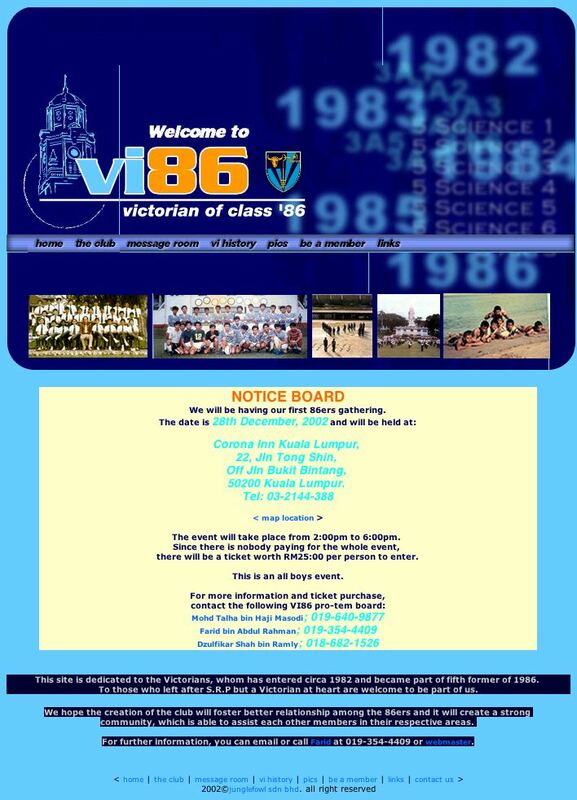 The History of VI86 website. I'm trying some coding , so any VI86ers can add news, pics or notes for all to share directly to the website . Hope it will work. Thanks for reading and spending time in this section. PS: All is in the past and let us look forward to better future in friendship and our daily life.